We take welcome very seriously at ARBC. We recognise that it is a privilege that we all share to make people feel loved and cared for. We also recognise that there are those among us who are particularly gifted in this area. 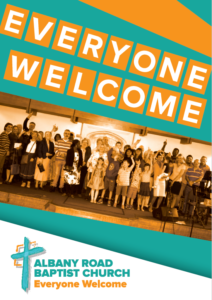 The Welcome Team was formed to make sure that whether it is your first or your hundred and first visit to Albany Road Baptist Church you are made to feel welcome. Each Sunday after the service there are people available at the Welcome Desk in foyer to answer your questions; take bookings for particular events and point you to any information that will help you find your way around the church. Once a month you are invited to join others as they go across the road to The Claude for Lunch. There are always those who would prefer to linger longer and eat together rather than going home. It is a great way to get to know other people. Once a term we hold a Welcome Lunch where we invite those who are new and becoming regular and some of the more established folk to come together to eat. At this event we introduce you to what the church stands for and invite you to join with us as we seek to minister to our community.